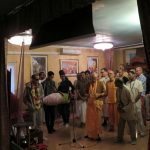 The devotees of Cape Town were very happy to finally have Kadamba Kanana Swami’s association again since his visit in December last year. 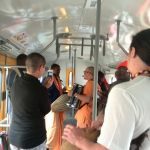 He arrived on Friday, 02 September and rested at the temple that afternoon before his week of activities in Cape Town began where he gave a lot of his time to preach to students and newcomers (while giving more than enough time to the devotees as well, of course). 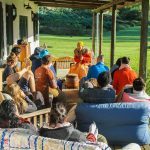 Maharaj made his first appearance on Saturday morning where he lectured on the Srimad Bhagavatam verse 1.9.25, and later in the day, he set-off for the majestic Bohdi Khaya Resort in Gansbaai (approximately 2.5 hours out of Cape Town) for a student retreat that was taking place. 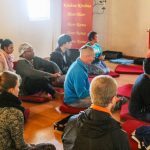 Bhaktin Bavisha has been acting as the chairperson of the Bhakti Yoga Society at the University of Cape Town campus for this year and Maharaj has expressed how pleased he is with how she has put her heart into growing the program both in terms of attendance as well as administratively. With the help of her very dedicated committee members both on and off campus, she expertly pulled of a first-class student retreat. When we arrived at the venue on the Friday, the sun was occasionally peeping out from behind thick, grey clouds but mostly we were getting washed down with piercing rains which seemed to be drowning out all fear, anxiety and stress. We were tucked away from mundane city life, safely cradled by the Witkransberg Mountains in Gansbaai. The smell of fresh, wet soil and grass filled the air, reminding us of nature’s potency. 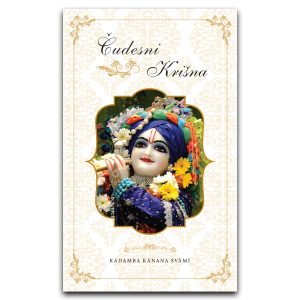 Upon the arrival of Kadamba Kanana Swami, the rains retreated obediently and the sun shone down on Maharaj in ecstasy. 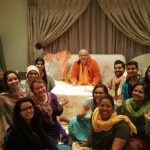 The students from The University of Cape Town’s Bhakti Yoga Society welcomed Maharaj with excitement. Some welcomed Maharaj as an old friend and others in awe and reverence. 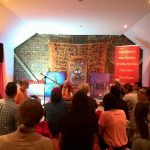 The mood ascended immediately as Maharaj led an ever-ecstatic kirtan into the evening. After Maharaja’s talk, a few students remained behind with Maharaj where he taught them how to play some of his well-known melodies on the harmonium. The evening ended with mellow drumming around the fire and a blanket of stars winking down at us. Our Sunday morning began peacefully with japa meditation followed by some sweet kirtan lead by the students. 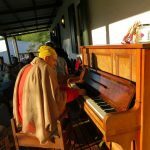 Maharaj displayed his musical skills as he effortlessly harmonized along with them on the patio piano. During the morning talk that followed, Maharaj stressed the point that while meditating, it is not possible to clear the mind completely and focus on nothing. He emphasised that the mind is constantly busy, engaged in many thoughts. Maharaj gave the example of how one may clean out a room completely but ultimately will require some essential items. Similarly, the mind is the same. It may filter many things, but still it requires so much. 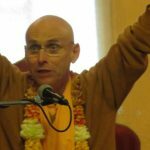 When asked by a student what to do once one understands that the senses must be regulated and controlled, Maharaj responded by explaining that the senses cannot be idle. The senses must be engaged in some activity or the other as that is its nature. So why not engage those senses in devotional service! After the morning class Maharaj spent a short while speaking with the students personally before heading back to Cape Town. 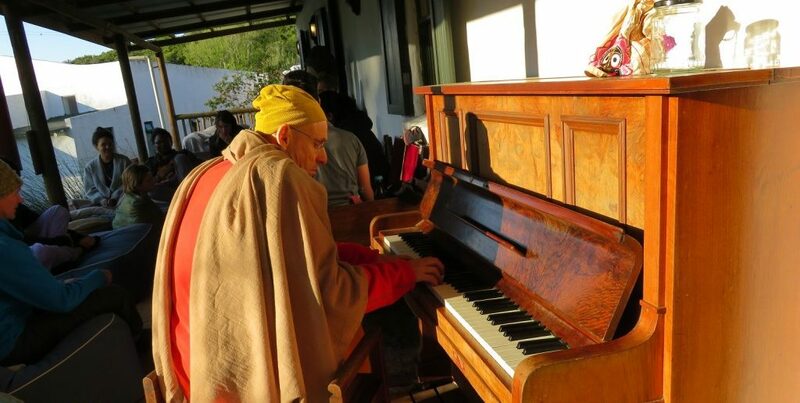 Maharaj made it back to Cape Town in good time for the Sunday Love Feast where he led Guru Puja and an awesome hour-long kirtan before his lecture. The temple full of happy faces who were all thrilled to have Maharaj around and to drink in the nectar of his association. He spoke on the Bhagavad-gita verse 9.14 and elaborated on the qualities of a mahatma (a great soul). Maharaj spent a lot of time after the program speaking with devotees until eventually retiring for the evening. After such a jam packed weekend – Maharaj took a well deserved day of rest to prepare for the rest of the week ahead. I am not a brahmana (priest or Vedic scholar), ksatriya (warrior or administrator), vaisya (agriculturalist or businessman), or sudra (worker), nor a brahmacari (celibate student), grhastha (householder), vanaprastha (renounced householder) or sannyasi (full renunciate). 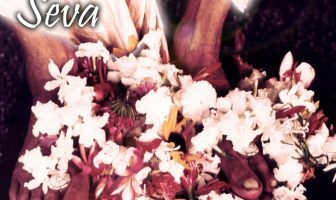 Being transcendental to this gross and subtle body, I am the servant of the servant of the servant of the lotus feet of the master of the gopis, Sri Krsna, who is the ultimate shelter of everyone, full of transcendental bliss and an ocean of unlimited nectar. 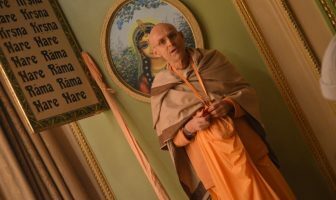 It was a full house at Harish Chandra Prabhu and Mamatamayi Radhika Mataji’s home that evening when Maharaj graced their presence along with HG Medhavi Prabhu (ACBSP). The evening started off with a very deep and meditative kirtan and ended off very sweetly with Maharaj and Medhavi Prabhu swinging the microphone back and forth (literally) as they shared sweet pastimes of their days in the service of ISKCON. 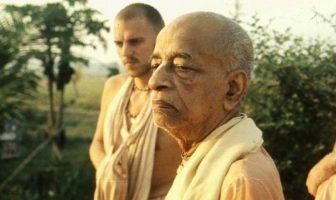 Medhavi das means one who is the servant of the one with sharp intelligence and after Medhavi Prabhu had shared his pastimes in ISKCON with us, Maharaj complemented Medhavi Prabhu’s detailed memory. 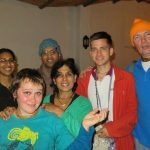 Bhaktin Tesham has recently started heading up an official youth group for the Cape Town yatra, assisted by a very enthusiastic and able co-committee and Maharaj blessed the youth group with their future endeavours at the end of the house program. There was lots of fun and laughter as the youth tried to get a group picture with Maharaj but somehow or the other kept getting photo bombed by some enthusiastic devotees wishing to be in on the fun. 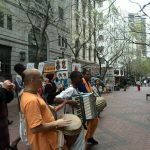 Spirit Matters is a program aimed at youth and newcomers to Krsna Consciousness that runs from the yoga loft of the temple every Wednesday. 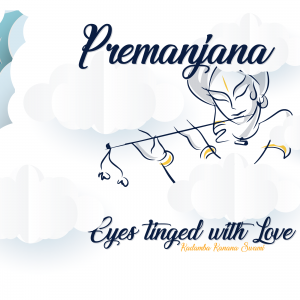 After a busy day of sound checks, set up and decor by Bhakta Kevin and Bhaktin Lameez and a transcendental prasadam feast cooked by Brhat Mrdanga das, the scene was finally set and the guests started pouring in very punctually at 18:30 in an excited buzz anticipating the evening’s program. 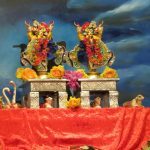 Lord Jagannath was there smiling at the crowd like a Cheshire cat from behind Maharaj accompanied on His left and right by the Panca Tattva and Lord Vishnu respectively, all very lovingly painted by one of our many in-house temple artists, Bhakta Michael. The room filled up quickly with approximately 80 people and it was noted that this had by far been the largest attendance of new people at the program this year. Maharaj definitely brought in the shakti! 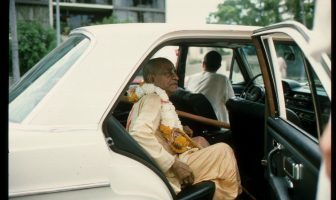 After an opening poem which was borrowed from a poet named Zdravko Stefanovic and dedicated to Lord Gauranga, Maharaj took the wheel and drove the crowd straight to Goloka Vrindavan by sometimes gently playing his harmonium whilst simultaneously poetically narrating sweet words about Krsna, Vrindavan and the love of devotional service and at other times playing his harmonium in the usual full-blast rock star mood of Kadamba Kanana Swami, thus getting the crowd completely fired up through close to an hour’s worth of flying kirtan. Maharaj then gave an incredible lecture and ended off with another “5 minute kirtan”. 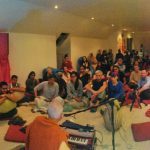 It was noted how progressive the evening was and how by the end of the evening it was clear that Maharaj had managed to touch the heart of every person there who were all smiling from ear-to-ear and who were all completely blissful. 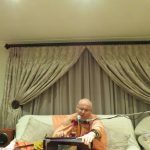 Maharaj left Cape Town on Thursday afternoon and headed off to Durban for the party of the year with Srimati Radharani and Lord Radhanatha at the Durban temple.